Cars would not be able to exit the Brooklyn Bridge at the span's end, but would have to take their damn congestion elsewhere. Meanwhile, pedestrians and cyclists would get a huge boost. Photo: 2018 Massengale & Co LLC, rendering by Gabrielle Stroik Johnson. New Amsterdam, meet actual Amsterdam. Crowded streets in Lower Manhattan must give more space to throngs of tourists and other pedestrians with new designs that would bring motorists to a crawl, says a neighborhood group that is pushing the European-styled solution against a mayor who has refused to implement changes to reduce the vast domain of the automobile. 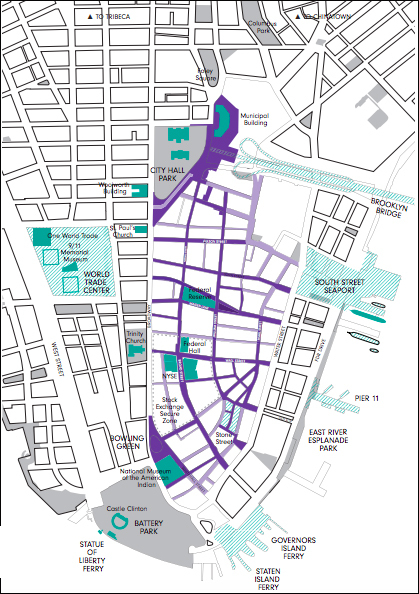 The Financial District Neighborhood Association is seeking the obvious mix of more small parks, fewer parking spaces set aside for city workers and overnight sanitation collection — but the exciting “Make Way for Lower Manhattan” plan [PDF] also calls for the elimination of several roadways to create an expanded Bowling Green and a plaza at the crowded end of the Brooklyn Bridge. The proposal takes inspiration from shared streets programs across the world, such as La Rambla in Barcelona, most of Amsterdam and Istanbul’s Golden Horn. The Financial District group envisions many streets being transformed into shared spaces for pedestrians, cyclists and cars — with 5 mph speed limits. “Our thinking is something like a slow streets program, something that has been done in cities across the world,” said Patrick Kennell, the group’s founder. New Yorkers have been wondering how to solve congestion below Chambers Street since, well, before there was a Chambers Street. The street grid — such as it is — dates back to the original Dutch colony of New Amsterdam. All those small lots encouraged skyscraper construction, which was great for Lower Manhattan’s dominance as a world capital, but was not so great for movement of goods and people. One hundred years ago, the key to easing congestion was to build a subway system that sped development northward. But the rise of the automobile complicated that effort. And when sidewalks and roadways feel so narrow, no one wants to give up any space. In 2010, as the downtown population surged towards its current 75,000, the Department of Transportation recommended transformation of many Lower Manhattan streets into “shared” roadways. Very few were actually implemented. “These issues threaten to undermine both the quality of life in New York’s most historic district and its ability to grow,” the report said. Bowling Green (left, current) and the Wall Street Bull (unpictured) would finally accommodate the pedestrian hordes (right). Photo: Google; 2018 Massengale & Co LLC, rendering by Gabrielle Stroik Johnson. The solution, of course, is to reduce the space for automobiles — and completely pedestrianize part of Lower Broadway and Centre Street from Chambers to below City Hall. 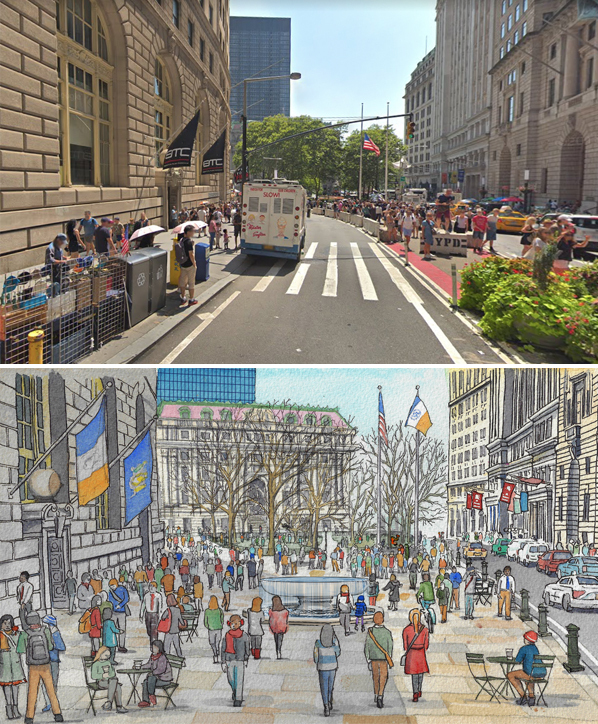 And the widened pedestrianized area near the Charging Bull sculpture would allow tourists to interact with the statue and make better use of the currently under-visited Bowling Green, the report added. It’s no coincidence that these two major walking areas connect through the largely pedestrianized area near the stock exchange. “[These] three major gathering places that celebrate FiDi’s history could anchor the slow-street district,” the report said, citing the desire of tourists to move seamlessly among attractions, just as visitors in London, say, move from the National Gallery to Nelson’s Column in Trafalgar Square without having to encounter cars. And more shared streets — where cars and pedestrians mingle at walking speed — mimic the approach of cities like Amsterdam. The shared streets idea is very popular in Europe, where pedestrian safety is paramount. 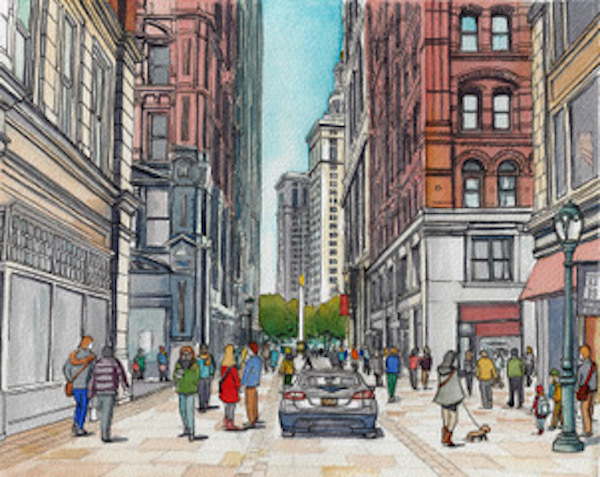 This is a rendering of what Nassau Street in Lower Manhattan could look like. Photo: 2018 Massengale & Co LLC, rendering by Gabrielle Stroik Johnson. As such, the report does not create any truly large car-free zones, as its authors likely realized that such a proposal — though implemented successfully many world-class cities — is a non-starter for Mayor de Blasio, who has consistently rejected the idea. But this mayor will be gone in two years. One of his would-be successors, Council Speaker Corey Johnson, says he would be far more aggressive in “breaking the car culture” than de Blasio has proven in his second term. But the mayor’s Department of Transportation is open to some of the Lower Manhattan proposal. “We’ve held a Shared Streets event in the area previously and we welcome input such as this, which we will review,” said agency spokeswoman Alana Morales. Transportation advocates say the Lower Manhattan proposal is a step in the right direction for reclaiming streets for pedestrians. And in case anyone is worried about the Amsterdamification of New Amsterdam, the former bike mayor of the idyllic Dutch pedestrian and cycling haven says residents of her city quickly figured out how to share the space. And few people chose to drive into many areas of the city because it costs too much to park. A very necessary start using shared streets . How do bikes fit into this plan? Does it reduce the projected number of cars crossing the Brooklyn Bridge? Would this facilitate moving the bike path on the bridge to what is now a roadway lane? security measure in response to the 1993 WTC bombing, not 9/11. While the lack of cars is appreciated by most, the lack of pedestrian-oriented design is not.